UPDATED: Is the cost of Winnipeg’s BRT already going up? The Winnipeg Free Press is reporting that the cost to the city will now be $7.25 million — up $3 million over the initial budget. That means that Hydro is covering $18 million of the project in the name of infrastructure renewal. If Manitoba Hydro is paying $18 million for infrastructure renewal, why wasn’t this project in their infrastructure renewal plan? Is Hydro subsidizing BRT, and if so why? Is the city going to pay the full amount by 2016 as scheduled? Will the additional $3 million come from the construction contingency? Where will the cash be found? If the project goes over budget, might the City be on the hook for even more? One of the knocks against the initial design of the extension to Winnipeg’s meagre Bus Rapid Transit route was the cost of acquiring land alongside CN’s Letellier main line west of Pembina Highway. The current “dogleg” route along a Manitoba Hydro corridor does not involve any land acquisition costs, according to an alignment study completed in January 2013. There is plenty of land amongst the high voltage hydro towers, and it was assumed to be free for comparison purposes. So, the question needs to be asked: if $4.25 million is included in the budget, and the project is going to cost $25 million or more (it’s not unprecedented for Hydro projects to go over budget you know) then where is the additional $20+ million going to come from? According to the Capital Integration Plan, “it is expected that the costs would be paid by the City to Manitoba Hydro in 2016 even though the commitment to reimburse Manitoba Hydro would be made in 2014.” Is Brian Bowman, our new BRT-friendly mayor, going to commit to paying Hydro the additional money before the end of the year? Does he plan on paying the full amount by 2016? If so, he has some work to do. The good news for Mr. Bowman is that he won’t have to dole out the entire $25 million. This is because, according to Manitoba Hydro, the amount also includes the cost of updating “aging infrastructure”. 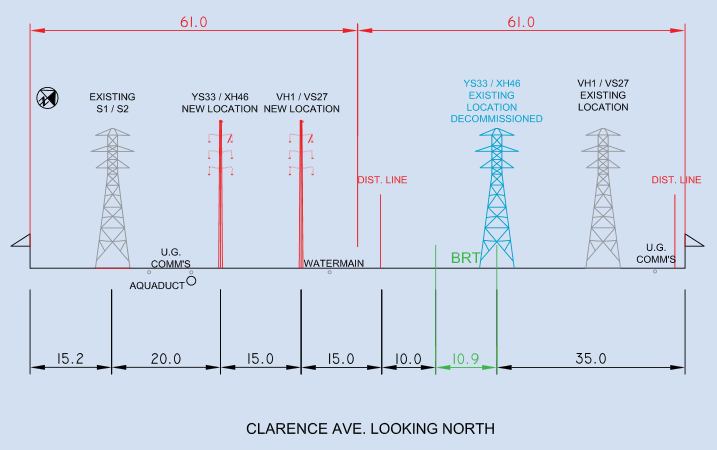 Hydro is taking this opportunity to replace the steel transmission towers with a newer design. How much of the $25 million is a result of relocating for BRT and how much is due to the aging infrastructure is unknown. My Hydro contact said that this was still being worked out. What is interesting about this is that the infrastructure does not appear to be in need of replacement. There are three rows of towers, all with the same design, but only the one row that is in the way of the transit corridor is being torn down. The other two, with the exact same construction, will remain standing, and one of those will remain fully operational. I am therefore skeptical of the claim that this is “aging infrastructure”. Hydro has a Long-Term Development Plan, updated as recently as last year, that addresses aging infrastructure in some detail, but only refers to transformers, circuit breakers, and wood pole structures. There is no mention of steel transmission towers like these. According to an FAQ for Ontario’s utility Hydro One, transmission towers of this kind typically have a life span of 100 years or more . That makes these towers middle-aged, with plenty of useful life left. Perhaps replacing them now will remove the need to do it 40 or 50 years from now, but the discounted benefit of doing it now would be quite small. For this reason I believe Manitoba Hydro will try to pin as much of the $25 million cost on the City as possible, even though they initially estimated the cost to the City at less than one fifth that amount. If this is indeed new cost that is unaccounted for in the $408 million Southwest Transitway – Stage 2 construction budget*, then I believe the current cost sharing arrangement between the City and the Province would need to be revised, or more likely this will simply come out of the $69.4 million Construction Contingency that is built into the existing model. That would obviously leave less money for additional cost overruns, on a large scale project that is still a long way from the start of construction. Perhaps more concerning is that there is additional evidence the initial alignment study is flawed, and that the route we’re building is not the best route at all. This is important. Once we build it we can’t un-build it. We need to do it right the first time, but the alignment study over-valued the Transit Oriented Design benefits of the current “dogleg” route (more on that later), and now it appears it undervalued the costs of building this route. After all, when the alignment study was done, it wasn’t even certain there would be any costs at all related to Manitoba Hydro. I know that Mayor Bowman is eager to get on with the BRT project, which was a central pillar of his campaign, but I think it’s clear that we need to step back and take a second look at the current plan. The are too many unanswered questions about the real estate transactions involving the Parker lands, the environmental impacts, the benefits of rapid transit through this corridor and the costs of building it. Bowman so far as shown no interest whatsoever in reviewing this BRT route, but if we have learned anything from the Sam Katz era at City Hall it’s that we need to exercise proper due diligence before diving into a large project. Let’s not start off the new era by making another huge mistake. * The total project budget of $590 million includes the following components: $408 for Southwest Transitway - Stage 2, $73 million for Pembina Underpass Widening, $40 for Land Drainage and $69 million Construction Contingency on all of the above. Manitoba Hydro: Finally figuring it out.